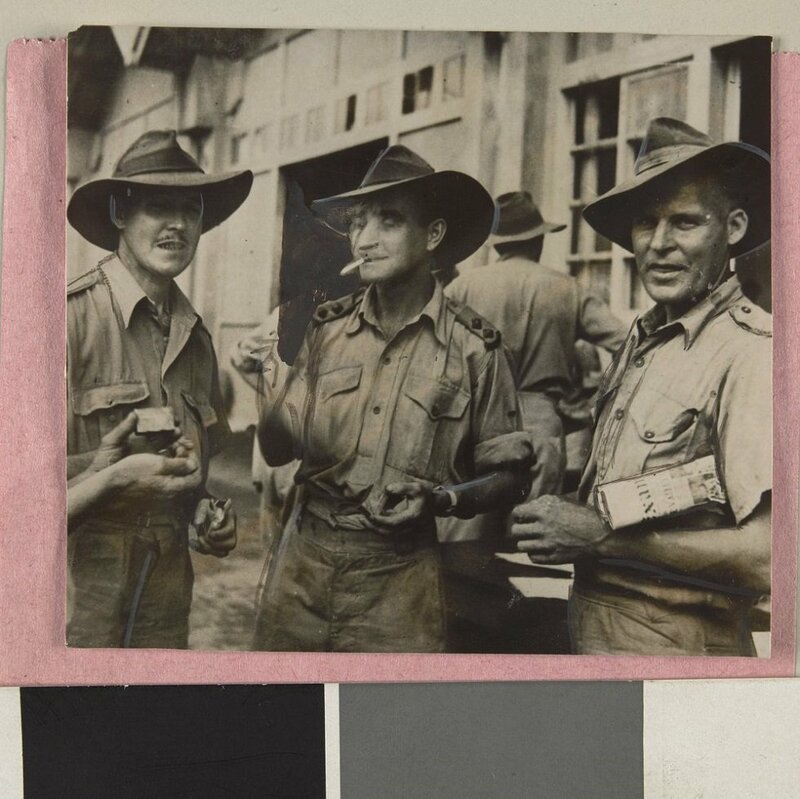 From left to right, Sergeant Perc Elsum, Lieutenant Vern Steward and Sergeant Charlie Crouch, recently liberated from Ambon, enjoying a smoke as they await transport home. Image courtesy of Argus Newspaper Collection of Photographs, State Library of Victoria. 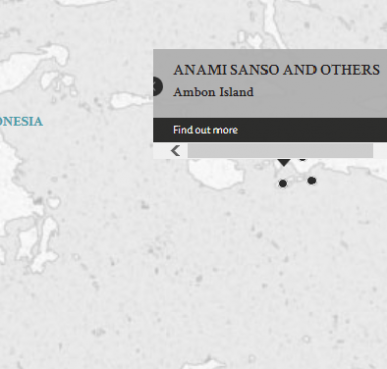 The thirteen defendants were accused of ill-treating and, in one instance, killing a POW who had been interned in camps located on several Javanese islands in the Netherlands East Indies (present-day Indonesia). One of the highlighted incidents included the boarding of thousands of POWs on the SS Maros with live and dangerous war materials like bombs and ammunication on board. The accused comprised of the various camp commandants and their subordinates, who claimed that they had not ill-treated POWs under their charge and did the best they could, given the circumstances. The Court found all thirteen defendants guilty of various charges. Six defendants were sentenced to death by hanging, while the others were sentenced to varying prison terms. The first defendant, Lieutenant Colonel Anami Sanso, submitted a last minute statement after all the cross-examinations had taken place, claiming full responsibility for the entire string of incidents, pleading the Court not to find his men guilty of the offences. The Court nevertheless found all thirteen defendants guilty of various charges, and sentenced six defendants, including Anami, to suffer death by hanging. Anami, Sanso. Lieutenant Colonel. From Japanese military. From Japan. Guilty (First, second, third, fourth, fifth and sixth charge). Death by Hanging. Sentence confirmed. Shimada, Kuranosuke. Captain Doctor. From Japanese military. From Japan. Guilty (First, second, third, fourth, fifth and sixth charge). Death by Hanging. Sentence confirmed. Shiosawa, Kasue. Captain. From Japanese military. From Japan. Guilty (Third and fifth charge); not guilty (First charge). 15 years' imprisonment. Sentence confirmed. Ueda, Tadao. Captain. From Japan. Guilty (First, third and fourth charge). Death by Hanging. Sentence confirmed. Mori, Masao. Sergeant Major. From Japan. Guilty (First, second, sixth and seventh charge). Death by Hanging. Sentence confirmed. Kawai, Kichijiro. Sergeant Major. From Japan. Guilty (First, third and sixth charge). Death by Hanging. Sentence confirmed. Yamamoto, Yoshikasu. Sergeant Major. From Japan. Guilty (Third and fourth charge); not guilty (First charge). 10 years' imprisonment. Sentence confirmed. Kasayama, Yoshikichi. Yonin (Korean Guard). From Korea. Guilty (Second, sixth and seventh charge); not guilty (First charge). Life imprisonment. Sentence confirmed. Toyoda, Ginjiro. Yonin (Korean Guard). From Korea. Guilty (Second charge); not guilty (First charge). 10 years' imprisonment. Sentence confirmed. Kanekado, Kankon. Yonin (Korean Guard). From Korea. Guilty (Second charge); not guilty (First charge). 10 years' imprisonment. Sentence confirmed. Kimura, Shigeru. Yonin (Korean Guard). From Korea. Guilty (Third charge); not guilty (First charge). 7 years' imprisonment. Sentence confirmed. Fujimoto, Yoshio. Yonin (Korean Guard). From Korea. Guilty (Third charge); not guilty (First charge). Life imprisonment. Sentence confirmed. Kurashima, Hideichi. Captain. From Japan. Guilty (First, second and sixth charge). Death by Hanging. Sentence confirmed. Monod de Froideville, C. Lieutenant Colonel. From Dutch military. Sahay, S.B. Major. From Britiah Indian army. B. L. Advocate in India. Cooper, J.R. Major. From Australian military. LLB Advocate (OS). Yamashita, Ukieli. Prosecutor at the Tokyo District Court, Japan. Sawada,Tetsuo. Judge of the Sendi District Court, Japan.